Charity football tournament under the slogan “Love for the children, in memory of their fathers-Heroes” was held in Varna. The noble cause collected 9000 lv for the children. The event was held on the playgrounds of Technical University – Varna on 13 and 14 June 2015 in front of big number of supporters. 26 amateur teams (of 6 players) took part in the tournament, including Top Rent A Car. 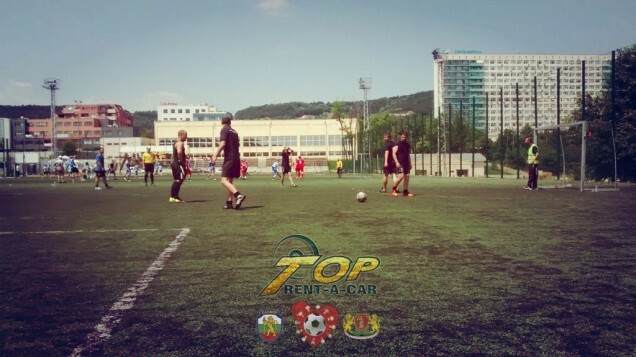 The team of Top Rent A Car played matches versus all of its opponents from the same group (Varna Municipality, Gastrade, Gabrovski and Varna Prison). The duration of every match was 2×15 minutes. Even participating for the first time in the tournament, national’s car rental company team succeeded to score in every game despite the high temperatures. There was not enough team experience for bigger success, but taking part of the event they showed their respect and put their names between the 26’s. The group stages was in the first day and only the best teams of every group continued to the finals. All of the matches was played at the same time on the three playgrounds. Referees from Bulgarian Football Union was provided and also medical service from Military hospital. On the 14th of June (Sunday) was held the finals and the trophy went to the Specialized police forces after penalties against the team of Medical university – Varna. By participating in this tournament, all the teams contributed the noble initiative and the Bulgarian football. At the and the organizers awarded the winners with the Cup and gave diplomas to all. A trade union of the officers of Ministry of Interior, A trade union of the officers of prisons in Bulgaria, Naval Academy “Nikola Vaptsarov”, the Association of Women soldiers and the municipal administration. Sixth group: Varna Municipality, Gastrade, Gabrovski, Top Rent A Car, Varna Prison.